When you’re pushing 50 tons down an open road doing the legal limit, you’re bound to meet some resistance. Wind, most likely. And if your rig isn’t designed and spec’d to minimize aerodynamic drag, you’re certainly paying for it in increased fuel costs over your long haul and in the long run. In on-highway applications, aerodynamics contributes 50% to overall fuel economy, so it’s critical that the vehicle is designed and spec’d to minimize aerodynamic drag. One of the basic principles of aerodynamics is to keep airflow “attached” to the vehicle. This attachment results in smooth airflow around the vehicle instead of allowing the air to become detached, creating highly turbulent airflow. These turbulent areas cause the air to behave as if the vehicle were larger than it really is, resulting in increased drag and decreased fuel economy. The ProStar is designed to properly manage the airflow to the sides of the trailer. Smooth radius edges are a signature styling element that increases fuel economy. The windshield radius and A–pillar design were developed in a wind tunnel to ensure optimum performance. 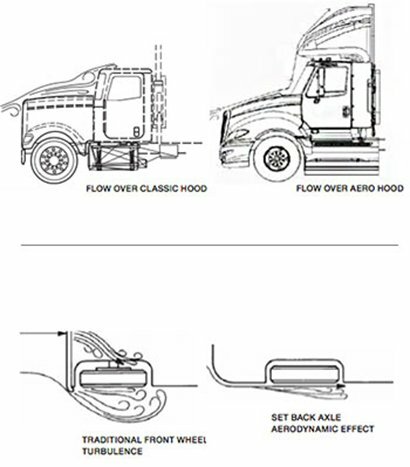 Transition areas such as the cab-to-sleeper or the cab extenders are all designed to guide the air to a smooth, non-turbulent flow that attaches to the sides of the trailer. The sloped hood design is carefully crafted to guide airflow both around the sides of the cab as well as onto the windshield. From the windshield, the air continues either over the vehicle along our patented roof shape or around the doors. Details like the air cleaners, mirrors and sunshade are designed to minimize aerodynamic drag. Front axle position can also affect aerodynamics. Set-back front axles not only improve loading characteristics, but also incorporate some distinct aerodynamic advantages. As shown in the illustration, a highly separated airflow region is created alongside the front wheels because of the bumper design. This creates a localized low-pressure region that allows engine compartment air to blast through from the front grille. Chassis skirts improve air movement along the sides of the tractor by reducing air turbulence around the front fender extensions, fuel tanks, battery box, frame access steps and quarter fenders. Cab length chassis skirts extend to the back of the day cab or sleeper cab. Full-length chassis skirts extend to the rear wheel. Side extenders are helpful in directing airflow past the tractor and trailer gap. It is important to remember that with large trailer gaps, even on vehicles with side extenders, turbulence begins to form as the air passes over and around the tractor and hits the nose of the trailer. The side extenders reduce airflow between the tractor and trailer and are effective even with trailers that are not full height. Trailer gaps should be kept to the minimum that provides adequate swing clearance. An extended roof fairing or air deflector further improves aerodynamic efficiency when full height trailers are used. If a long haul sleeper pulling a dedicated trailer is not a typical tall van body, it is highly recommended to match the tractor height to the trailer height for maximum fuel economy. The Hi-Rise Sleeper, with or without a roof air deflector, helps customers match flatbed and bulk haul trailers with appropriate height tractors. In some refrigerated van trailer applications, it may also be desirable to operate a Hi-Rise Sleeper without the roof fairing to allow significant frontal air to the front of the refrigerated cooling unit. 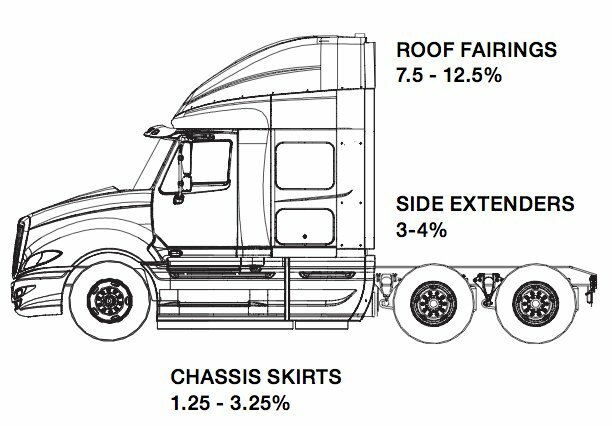 To reduce aerodynamic drag, the trailer gap should be kept to a minimum, generally 36″ or less. Whether fixed or sliding, make sure that the fifth wheel is installed with just enough clearance to allow the trailer to swing to either side without coming in contact with the cab, side extenders or trailer landing legs. Vehicle and trailer wheels are also culprits of creating detached airflow and increasing aerodynamic drag. By leveraging wheel covers on both the vehicle and trailer wheels, you can expect to see around a 1% increase in fuel economy. To become the industry leader in aerodynamics, International leverages different types of testing to understand the true effect of aerodynamic drag in various types of conditions. Computational Fluid Dynamics (CFD): With a computer model, engineers get insight into airflow under, around and through the vehicle. 1/8 Scale Wind Tunnel: This test is used to help refine the basic shapes of the vehicle such as the curvature of the fenders and hood. Much of this work is done in clay where designers can literally re-sculpt these surfaces over and over until the desired combination of appearance and performance is achieved. Full Scale Wind Tunnel: This includes testing a complete tractor and trailer and allows the engineers to turn the vehicle 360 degrees to account for any impacts in crosswinds. Why is this important? The average wind in North America at any given time is 7 mph and the direction is random. Therefore, it is unlikely that a truck will ever be headed directly into the wind for very long. Coast Down: This test accurately depicts conditions out on the open road. Over the Road Testing: The true test of a vehicle’s performance is in real world conditions, not a lab. However, just as much scrutiny goes into how International conducts over the road testing to ensure our vehicles and our competitors’ are measured based on the same type of conditions and remove as many variables as possible. This process is governed by either SAE Type II or TMC Type IV which regulate everything from test vehicle mileage, drivers, trailers, routes and much more.